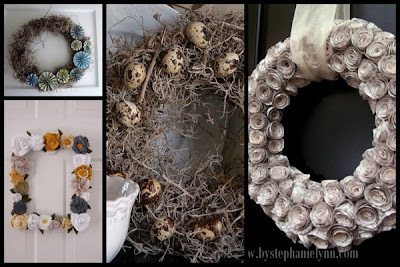 I have been searching and searching for inspiration to make a spring wreath for my front door. So many to choose from - I may make more than one! One for the door, one for the window, one to hang over a mirror... you get my drift. I am loving these wreaths made from coffee filters! We have a Tassimo coffee maker, so coffee filters are a thing of the past for us! I still have quite a few that I saved for that "one day" project. I thought it might be a kids craft...but maybe mom will use them this go around. I have a ton of Spanish Moss in my backyard. I've read a bit on how to dry it out so you can use it in projects such as these spanish moss wreaths. Maybe its time to put that to work! The spanish moss wreaths were made by Our Daily Chocolate and the other by Lindsay at Living With Lindsay﻿. I love the square wreath because of its shape. Delia Creates shares it on her blog. The paper rosette has to be one of my favorites not only because it's so shabby chic, but because I recognize how much time went into that one. 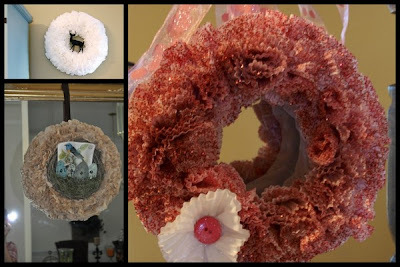 I've made the rosettes before, and making each individual one takes time...and to have enough for a wreath...WOW! Hats off to Stephanie Lynn at Under the Table and Dreaming!